Opioid Dependence or Addiction to medication such as prescription painkillers (oxycodone, oxymorphone, methadone, hydrocodone, etc.) 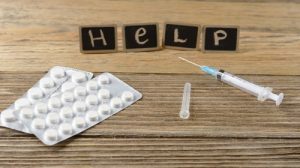 or heroin is a complex and devastating condition – but it can be treated effectively with medication-assisted treatment combined with counseling and support. We understand the process of recovery from addiction can be a long and painful one. By developing an individualized plan of care for each patient, the Dayton Opiate Recovery Center can help aid the patient into sobriety. As clinicians’ we make the process as easy as possible by providing both doctor consultation and counseling services with each visit. Both services in one convenient location! Medical Support – Patients who want to stop using/abusing opioids/heroin can find it very challenging. Many times patients want to quit their dependence but the thought of withdrawal keeps them dependent. The need to satisfy cravings or avoid withdrawal can be so intense that they feel desperate, anxious, depressed and distracted from their daily activities. At the right dose, and along with counseling, SUBOXONE Film can help people stay in treatment by suppressing withdrawal symptoms and reducing cravings. Staying in treatment can help reduce illicit opioid use. To read more about SUBOXONE, it’s side effects, it’s medication guide and it’s uses please refer to the manufacturer website for more details click here. With Psychological Support event recognition, triggers and coping mechanisms associated with past dependency are attributes that you learn to help minimize the risk of relapse as you rebuild your life. To read more about the Addiction Counseling offered at our facility please click here. Upon admission, patients undergo an extensive assessment, conducted by our on-site physician – addressing both the psychological and physical aspects of his/her addiction; this includes a urinalysis, blood analysis and pregnancy test for females. After their first appointment, patients are required to schedule a follow-up visit to ensure the dosage of medication is appropriate, for patient’s safety and if necessary dosage may be adjusted to alleviate any discomfort they may experience. This may be one to two weeks after the initial appointment, based on physician’s discretion. Patients will then be required to schedule follow up appointments every 28 days to ensure progression within the program. Counseling is required as part of a treatment program. Counseling is offered individually and in group sessions at no extra cost to you. After several months, as per physician’s recommendation, patients will be gradually tapered off of Suboxone by lowering daily dose until patients no longer require Suboxone. At this time counseling is still strongly recommended to watch for any signs of relapse.